Elen of the Ways Bronze Figure. Cast in the finest resin before being given a bronzed finish, this mystical guardian is available through Nemesis Now's Willow Hall Wholesale Giftware Collection. This Keeper of The Forest figurine depicts Elen of the ways, the antlered goddess who is the guardian of the leys, the ancient trackways. This female pagan deity is unique in that she is the only horned goddess, wearing the antlers of the female reindeer. 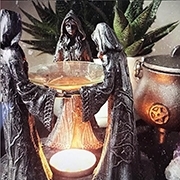 She is seen by many as a female equivalent of the Green man and Cernunnos, or a consort to Herne the hunter, and would make the perfect addition to any home.